One of the front lines of the world’s unfolding freshwater crisis is the historically water-fragile Middle East and North Africa—the heartland of Arab Islamic civilization and cradle of the ancient hydraulic irrigation civilizations that arose in the flooding river valleys of the Fertile Crescent. The politically volatile, overpopulated, dry land stretching from Algeria, Libya, Egypt throughout the Arabian Peninsula into Israel, Jordan, Syria, and Iraq, and their regional neighbors, is rife with water tensions, conflicts, and troubled states that hold the potential to combust into a full-fledged water war. The Middle East is the first major region in modern world history to run out of water. Country after country lacks the freshwater to grow enough crops to feed its population or to provide the basis for long-term rising living standards; per person measures of renewable water availability are widely below the minimum standard measures of scarcity and famine. The desert nations of the Arabian Peninsula and Libya, as well as arid Israel and Palestine, outgrew their internal water resources for sustainable food self-sufficiency in the 1950s. Jordan ran out of water in the 1960s, Egypt in the 1970s, and other regions more recently. The Millennium Ecosystem Assessment reported that in “the Middle East and North Africa, humans use 120% of renewable supplies.” They survive by importing growing volumes of food—virtual water—and, where available, by pumping water out of underground aquifers faster than nature can recharge them. Only the bonanza of surging oil income from the early 1970s has staved off a full-blown crisis. Oil wealth paid for the quadrupling of Middle East wheat flour imports to over 40 million tons within a single generation. 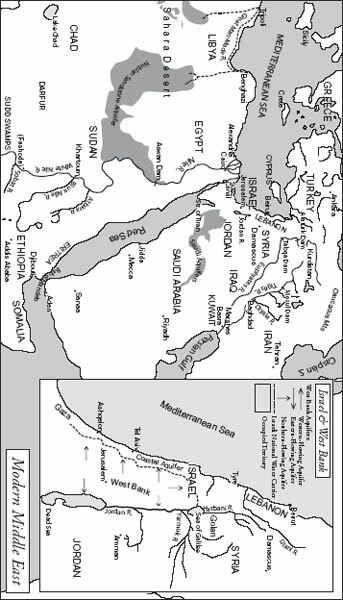 For most of Middle Eastern and North African history, exploitation of subsurface water deposits had been limited mainly to the excavation of shallow wells and qanats, the horizontal tunnels of antiquity that conveyed water from inside hillsides. Oil opened a new era by facilitating the large-scale subsidization of modern pumping of deep aquifer water for irrigation. Yet if oil built modern Middle East society, water holds the key to its future. In the end the region cannot escape the same water-fragile geography and stream deficit that shaped its ancient and Islamic civilizations, placed a ceiling on its indigenous, sustainable population size, and ultimately influenced Islam’s abrupt decline from glory from the twelfth century. Modern engineering of the region’s surface waters began in earnest in the nineteenth century. Irrigation and cheap oil energy metamorphosed the traditional population-resource equation underlying each society. From 1950 to 2008, the population more than quadrupled to 364 million. But country after country soon began to exceed the productive limits of the region’s water resources and waterworks capabilities. With population forecast to swell another 63 percent to 600 million by 2050, the Islamic Middle East is becoming a demographic volcano. The region’s upsurge in violence, radical religious fundamentalism, and terrorism is likely but a foretaste of what potentially lies ahead as its water famine worsens. From the dawn of ancient Egyptian civilization, farming along the Nile had operated unchanged as a natural, one crop, seasonal basin agricultural system able to support a peak population of 4 to 5 million. That ceiling had doubled in the nineteenth century with the introduction of barrages and year-round, multicrop irrigation. Under the advances of British hydrologists after 1882, population soared again. It was 25 million on the eve of the Aswan high dam’s opening. At the turn of the nineteenth century, the British-built low Aswan Dam perpetuated the Nile basin’s natural, self-sustaining irrigation system by permitting the passage of silt during flood season, while also protecting Egypt for the first time from disastrously large inundations. Yet the dam’s reservoir system was too small to store enough water to deliver Egypt from multiyear droughts. In the ensuing decades, British water engineers conceived plans for massive storage dams in highland lake plateaus of equatorial East Africa and at Lake Tana in Ethiopia where evaporation rates are low. They also attempted to augment the Nile’s total flow by building a long diversion canal to bypass the huge, stagnant Sudd swamps in British-controlled southern Sudan, where the White Nile loses half its volume to evaporation. But when the era of British hegemony yielded to national independence after World War II, Britain’s ambitious Nile plumbing projects were still mostly unfulfilled. With the end of British rule, the basin devolved politically into a fractious cluster of impoverished watershed states unable to undertake cooperative Nile development. The positive sum potential of maximizing the river’s productive resources through optimal, nonpoliticized, placement of waterworks vanished with it. The father of the Aswan Dam, Egyptian president Nasser, had come to power in 1952 with the transcendent dream that a giant dam at Aswan would, at a single stroke, give Egypt economic control of the Nile waters, insulate it from the caprices of nature and the disruptive political machinations of upstream Nile nations, deliver food security and economic modernization, and restore the independent, sovereign glory of Egyptian and Arab civilization. When American secretary of state Dulles withdrew his previous support, Nasser had in 1956 signed a deal with the Soviet Union to build the high dam, which quickly became the incarnate symbol of swelling Egyptian patriotism and a new political phenomenon, pan-Arabism. Although the Soviets desired to make a successful Aswan a beckoning symbol of socialist possibility for the entire third world, the first two years after construction began in 1960 seemed to confirm Dulles’s doubt that the Russians had the technical proficiency to meet the challenge. The dam fell behind schedule; despite the availability of a large, cheap Egyptian workforce, less than 10 percent of the rock and sand needed to fill it had been excavated. Nasser got the project on track, however, by breaking his pledge to the Russians and buying superior Western construction equipment to finish the job. Nasser did not live to see the completion of the Aswan Dam. He died five months before its official opening in January 1971. By 1975 it became fully operational. The high dam itself was a landmark engineering achievement, and influential political symbol of hope for Egypt and newly independent third world nations everywhere. Standing over 360 feet high and sweeping in a great curve for over two miles, it was the world’s highest rock-filled dam. If it were ever to burst, the torrential cascade downstream would strike with the destructive fury of a biblical plague, obliterating modern Egyptian civilization in its path. Its immense, 344-mile-long, eight-mile-wide Lake Nasser reservoir, which submerged land and ancient monuments and displaced over 100,000 inhabitants of southern Egypt and Sudan’s Nubia as it filled, stored over two times the average annual flow of the Nile. With some 30 times more storage capacity than the low dam it replaced, it protected Egypt for the first time in history against both extremes of drought and flood. Its 12 generators produced half of Egypt’s electricity when it opened. The effective gain in controlled Nile flow increased cultivated watered-desert cropland by 20 percent, as well as more extensive double and triple cropping on existing farmland. The ultimate proof of the dam’s success was that from the time it opened to 2005, Egypt’s population tripled to 74 million. Critics who warned that it was the wrong dam at the wrong place due to its many technical and environmental drawbacks were drowned out in the triumphal nationalism. Nasser’s insistence that it be located in the scorching desert on Egyptian national territory, for instance, caused its giant reservoir to lose a huge amount to evaporation—12 percent of the Nile’s estimated average 84 billion cubic meter flow at Aswan. The high dam also blocked the passage of fertilizing silt, transforming the Nile from a natural, self-sustaining irrigation system to an artificially managed river totally dependent on heavy chemical fertilizer and for the first time prone to salinization and waterlogging. Due to the dam, the natural Nile of history died at Aswan. Like America’s Colorado, the Egyptian Nile became a glorified irrigation ditch in which every drop was regulated. But when the dam opened with fanfare in the 1970s such problems were but an afterthought. They were left for future generations to contend with. Indeed, Nasser’s monumental legacy at Aswan seemed immediately providential by insulating Egypt from the terrible regional drought of 1979–1988 that resulted from the lowest Niles of the twentieth century. At a time when over a million upriver Ethiopians and an unknown number of Sudanese died of famine, Egypt’s growth continued unabated. During the decade-long drought, the average volume of Nile water reaching Aswan plunged 40 percent below normal. By July 1988, Lake Nasser contained so little water that it was within a dozen feet of reaching the total shutoff levels for the dam’s hydroelectric turbines, and was able to produce less than one-fifth of Egypt’s needs, forcing the country to rely more heavily on costly fossil fuels. Most alarming of all, Egypt was down to its last seven months’ reserve of irrigation water. Then, in August 1988, heavy rains providentially began to pour down in Ethiopia and Sudan. The great drought ended with the highest Nile flood of the century. Over the next few years, the man-made lake behind Aswan began gradually to refill. Egypt was saved. The great 1980s Nile drought, and the humanitarian tragedy it wreaked on Egypt’s southern neighbors, highlighted Egypt’s paramount national security priority in securing its near-monopolistic usage of Nile waters and the Aswan Dam’s linchpin role in delivering it. At the same time, it painfully exposed the dam’s military vulnerability, and the unimaginable devastation that would occur if its towering barrier were breeched in an attack. This double-edged geopolitical reality of the dam was pivotal to the historic decision of Nasser’s successor, Anwar el-Sadat, to boldly break Arab taboo by traveling to Jerusalem and set the stage for signing the 1979 peace treaty with despised enemy Israel. Egypt had been the key Arab military leader in the wars with Israel in 1948, 1956, 1967, and, under Sadat’s presidency, 1973. Yet despite some initial military success, Egypt saw the latter war end with Israel again astride the Suez Canal and holding enough air power superiority to make its rumored readiness since 1967 to bomb the Aswan Dam a palpable threat. Although it infuriated his Arab brethen, Sadat’s strategic decision to make peace with Israel brilliantly secured Egypt’s paramount national security interest over the waters of the Nile. At a stroke, it earned Egypt a diplomatic windfall of international goodwill, made it the second largest recipient (after Israel) of U.S. foreign aid, safeguarded the Dam, the Suez Canal and Egyptian territory against Israeli attack, and freed Egypt to redirect its otherwise superior regional military and diplomatic muscle to assert its commanding influence over developments in the vital Nile basin. Upon making peace with Israel, Sadat in 1979 famously highlighted Egypt’s shift in national security focus by declaring, “The only matter that could take Egypt to war again is water.” He even briefly broached the idea of a peace pipeline to bring a small amount of Nile water to Palestine and Israel, in an effort to ease water tensions and facilitate peace between Palestinians and Israelis. Sadat’s strategic focus on the Nile’s water was also informed by strident declarations of intent to dam the headwaters of the Blue Nile from Ethiopia’s new communist military leader, Mengistu Haile Mariam, who had seized power in 1974. Adding to Sadat’s unease was that Israel had been sending military support to Ethiopia throughout the 1970s to help it battle internal and neighboring rivals and that the two nations had long-standing affinities through Judaism, history, and a suspicion of Egypt. In the late 1950s, the U.S. Bureau of Reclamation began surveying Ethiopia’s immense, untapped, hydraulic potential at the behest of Emperor Haile Selassie. Still stinging from Nasser’s alliance with the Soviets on Aswan, America’s Cold War leaders had been happy to oblige. The result was an exhaustive, 17-volume bureau report identifying over two dozen irrigation and hydroelectric power projects, the latter with the potential to generate three times the hydropower of Aswan. By capturing and storing Blue Nile and tributary waters in the cool Ethiopian highlands where evaporation loss was only one-third as great as at Aswan, the bureau concluded, Ethiopian projects could vastly boost the region’s hydroelectric output and actually increase the overall available net downstream flow to Sudan and Egypt. In theory, it seemed like a win-win situation for all countries. But it put Ethiopia, not Egypt, in ultimate control of the amount of water reaching Aswan—precisely the nightmare that had haunted Egyptians for centuries. Egypt would have none of it. Desperately poor Ethiopia could not finance such ambitious projects itself. Through its far superior international diplomatic political influence, Egypt wielded an effective veto over Ethiopia’s multilateral financing and other potential avenues of water development it didn’t abide. Despite the fact that Ethiopia was the source of four-fifths of the waters of the Egyptian Nile, Egypt claimed an historic right of prior use over the lion’s share of the river’s volume. Upon launching the Aswan Dam project in 1956, Nasser had simultaneously moved to try to secure a Nile water sharing agreement with its southern neighbor, newly independent Sudan, within whose border part of the Aswan reservoir had to be situated. In late 1958, he found an accommodating negotiating partner in a kindred military Islamic leader who had just seized power in Sudan. The result was the Nile Waters Agreement of 1959. With breathtaking audacity, the accord divided up all the waters of the Nile between Egypt and Sudan: Egypt got three-quarters, or 55.5 billion cubic meters, of the estimated available flow after evaporation; Sudan received one-quarter, or 18.5 billion cubic meters, which, at the time, was far more than it could use. So Egypt effectively got use of the bonanza. The 1959 agreement totally excluded the water claims of Ethiopia and the seven other upriver states—it was, in effect, a Muslim Arab solution involuntarily imposed upon the sub-Saharan Nile basin. Moreover, Egypt and Sudan agreed to move jointly against upstream nations that acted to challenge them. Ethiopia, which used but 1 percent of the Nile basin’s water, vociferously rejected the treaty’s validity. In 1956 and in 1957 Selassie had obtained public declarations of support for Ethiopia’s Nile water rights from American president Eisenhower and vice president Richard Nixon, respectively. Yet in practice Ethiopia was powerless to prevent Egypt’s water grab. In the late 1970s, these tensions flared into bellicose exchanges between Sadat and Selassie’s communist successor, Mengitsu. Sadat nakedly threatened military reprisals if Ethiopia dared touch the waters of the Nile. The Arabic press in Egypt was soon aflame with anti-Ethiopian rhetoric, including menacing revisionist interpretations of the prophet Muhammad’s well-known directive to Muslims to leave Christian Ethiopia alone because its Axumite king had granted refuge to his early followers when they were forced to flee Mecca in AD 615. Ancient, proud, and never occupied or colonized, Ethiopia’s civilization dated back to the days of the Pharaohs. It was to the Ethiopian Land of Punt in the Horn of Africa that Egyptian Queen Hatshepsut in the fifteenth century BC sent her famous Red Sea expedition that brought back myrrh and live frankincense trees. Ethiopian lore told that King Solomon and the Queen of Sheba’s son brought the Ark of the Covenant to Axum in northern Ethiopia for safekeeping, where it purportedly remains under guard to this day. The Axumite Empire rose to prominence as an important link in the sea trade that Greek sailors opened around 100 BC between Egypt and India; at its peak its borders reached to southern Egypt and crossed the Red Sea into the Arabian Peninsula. The empire adopted Christianity in the same period of Roman Emperor Constantine’s conversion and the Ethiopian Orthodox Church maintained close ties to the Christian Copts in Alexandria until the mid-twentieth century. Despite Muhammad’s goodwill, Ethiopia began to decline after the seventh century as Islamic sailors took over more and more of the best trade routes to India and the Orient. From the mid-twelfth to early sixteenth centuries, Ethiopia underwent a golden period of expansion and revival, which put renewed emphasis on its linkages to Jerusalem, King Solomon, and its destiny as the legitimate successor to the Israelities. But by the late twentieth century, it was one of the world’s poorest countries with life expectancies of only fifty-three years. The extremely difficult, hydrological conditions on its highland plateaus were one of its most formidable obstacles to economic development. Rains were seasonal and varied unpredictably, while the flash nature of the muddy Blue Nile, which roiled torrentially a hundred feet high in its gorges in wet season and trickled almost uselessly in dry season, made dam control, bridge building, and other waterworks highly complicated, and several times costlier than comparable projects in gentler, temperate, and invariably richer nations. The confrontation between Ethiopia and Egypt abated after Sadat was assassinated in 1981 by Muslim fundamentalists. The new Egyptian president, Hosni Mubarak, pursued the more conciliatory approach long advocated by a senior Egyptian adviser, Boutros-Ghali, who favored joint, cooperative development of the Nile basin in order to derive its positive sum potential of increased storage capacity, reduced evaporation loss, untapped hydroelectricity, and, above all, more Nile water for irrigation. Despite Egypt’s more diplomatic tone, all the Nile basin plans and technological and financial assistance it offered remained inviolably predicated upon the other river states’ acquiescence to the one-sided 1959 Nile Waters Agreement, and gave Egypt an overgenerous share of all new water supply. Political and environmental obstacles also impeded the Nile basin development that was undertaken. Work on the 224-mile-long Egypt-Sudan diversion canal to nearly double White Nile flow by re-rerouting southern Sudan’s huge Sudd swamps was abruptly terminated in 1984 with only 70 percent excavated when it was attacked by black, southern civil war rebels who regarded it as a disenfranchising theft of a vital local natural resource and climate regulator for the benefit of Sudan’s northern Muslim rulers and their Egyptian ally. In early 1990 Egypt blocked an African Development Bank loan for Ethiopia over concerns that it would consume too much water. Not surprisingly, Boutros-Ghali’s Nile diplomacy yielded no major breakthroughs. The decade ended almost as it had begun. When Boutros-Ghali learned that Israeli hydrologists and engineers were doing feasibility studies on a number of dam sites in Ethiopia, with the potential to store as much as half the volume of water reaching Aswan, he summoned Ethiopia’s ambassador to the foreign office in Cairo in November 1989 and sternly warned that any damming of the Blue Nile would be taken as an act of war by Egypt unless it had its consent. Another cycle of water diplomacy began auspiciously in the early 1990s. Egypt and a new democratic government in Ethiopia led by Meles Zenawi agreed in principle that Ethiopia was entitled to an equitable share of Nile waters and to work cooperatively on Nile development. In 1999 Nile countries launched the World Bank–supported Nile Basin Initiative, a model in use in many international river basins around the world. Yet the real motivation behind the diplomacy was Egypt’s own ambitious plans to water its desert to ease the explosive population pressures building along its narrow, fertile Nile corridor. In 1997 it had inaugurated the controversial twenty-year New Valley Project, a large water transfer scheme akin to the one that helped transform Southern California in the 1920s and 1930s that required the diversion of an additional 5 billion cubic meters from Lake Nasser through an ancient channel of the Nile—water Egypt did not have and which it needed the cooperation of upriver states to obtain. To entice Ethiopia’s cooperation, Egypt offered support for Ethiopian hydropower dams, terracing of Ethiopia’s highlands that improved water usage, augmented river flows, and reduced troublesome silt loads arriving at Aswan, and for some small-scale irrigation projects. But any water storage that significantly enlarged Ethiopia’s capacity to expand its less than 1 percent of irrigated farmland was still not open to serious negotiation. It seems unrealistic that Egypt can long maintain its historical hegemony over the waters of the Nile at the expense of widespread poverty, malnutrition, humanitarian crises, and oppressive, dysfunctional government among a fast-growing population of several hundred million Africans upriver. Two of the most horrific genocides in recent times, in Rwanda and Sudan, occurred in Nile basin states. Burundi, like Ethiopia, is one of the three poorest nations in the world, and the Horn of Africa is a war-torn wreckage of failed states and recurring famine. The Nile is these nations’ greatest natural asset for development, too. Ethiopia, for instance, has unlocked a mere 3 percent of its hydropower potential. Often heralded as the future breadbasket of Africa, and encompassing over three-fifths of the Nile basin, Sudan is irrigating only 1 percent of its arable land. It defied history that, pressured by dire necessities, Egypt’s neighbors wouldn’t eventually find means among today’s ample global resources to utilize more of the Nile’s waters for themselves, with or without Egypt’s assent. It is a recurring pattern that civilizations born downstream in the fertile deltas and flooding river valleys saw political power eventually gravitate upstream toward those in the best tactical position to control the river’s flow. Inexorably, Egypt’s day of water reckoning is drawing nearer. Its dependence on foreign grain imports—providing up to two-fifths of Egyptians’ daily bread—to make up for its freshwater deficit is growing. Simultaneously, the deleterious, long-term environmental impacts of the Aswan Dam are impinging with escalating force. With the river’s fertilizing silt being entrapped and building up at the dam, Egypt’s farmland is suffering the depletions common to intensively irrigated cropland everywhere. Soil salinization and waterlogging are eroding farm productivity throughout the delta and the Nile Valley. Without the natural silt buffer brought by the predammed river, Mediterranean seawater has intruded as far as 30 miles inland. The fertile delta, home to over 30 million Egyptians and comprising two-thirds of Egypt’s agricultural area, is shrinking. The precipitous decline in annual water volume reaching the Mediterranean Sea from 32 to only 2 billion cubic meters following the Aswan Dam’s erection is depriving the coastal and marshland fisheries of replenishing nutrients and gradually destroying much of Egypt’s once-thriving sardine and shrimp fisheries. The reliance on massive amounts of chemical fertilizers is also exacting a heavy toll in both the Aswan hydroelectricity consumed in its production and from the pollution of the Nile and delta lagoons. Thanks to fertilizer discharge, water hyacinth blooms choke irrigation canals, while infestations of the snail carrying schistosomiasis, the debilitating liver and intestinal disease, has been spreading. In short, the full cost accounting is just coming due on Nasser and Egypt’s fateful mid-twentieth-century decision to submerge forever the Nile’s unique identity as world history’s only self-sustaining major irrigation system behind the iconic, pyramid-like giant dam in the hot deserts at Aswan. At 75 million people and adding more than a million more each year, Egypt is dangerously outstripping the current productive limits of Aswan and the Nile. A second scissors blade, meanwhile, is closing on Egypt from the swelling demand for Nile water from the population boom going on throughout the Nile basin. In 2006 Egypt, Ethiopia, and Sudan had a combined population of 192 million; they are projected to add nearly 50 percent to reach 275 million by 2025. When all the Nile basin countries are counted, some half a billion people—overwhelmingly young, poor, and bred amid continuous violence—will be struggling to live off the waters of the Nile. The prognosis darkened further when other related problems of global water scarcity are added to the picture: World food prices, which hit record highs in early 2008, are likely to climb higher in coming years from the 50 percent increase in world population, rising middle class demand for animal protein in China and India, and even possibly from tapering supply if America continues its early rush to corn ethanol biofuels as a gasoline substitute. At the bottom of the food chain are the water indigent, who spend most of the family budget on food and simply have no margin to absorb the higher cost of their daily bread. Climate change forecasts, if they come to pass, add to the potential for cataclysm. Models predict that Nile flows might decline up to 25 percent from altered precipitation and evaporation patterns, while rising sea levels could inundate large tracts of Egyptian delta farmland. In early 2008, Egypt experienced a possible foretaste of its future when 11 people died in violence linked to lengthening bread lines caused by shortages of the government subsidized, traditional flat round loaves costing one cent (five piastres) arising from the combination of record grain prices and endemic official corruption. Mindful that bread riots could topple governments, President Mubarak called in the army to bake and distribute additional loaves. In short, Egypt and its basin neighbors are sitting atop a growing demographic and hydrological time bomb, with Nile water scarcity as its detonating fuse. Like many nations facing world water famine, Egypt seems to have but one rational policy response: expand its existing water supply through aggressive efficiency improvements at home, cooperate with fellow basin nations to maximize the absolute volume that can be sustainably extracted from the river, and restructure its economy around the reality of its long-term reliance on the integrated global trading system to import its water-intensive necessities, such as food, until the day when an innovative breakthrough might bring its water resources and population levels into sustainable balance. It is hard to overstate the immensity of Egypt’s political and cultural challenge. Fully embracing such a cooperative approach to the Nile means surrendering its proud self-image as the downriver hegemon that has been ingrained in its national psyche over many millennia. As a thought experiment, it is the symbolic equivalent of Egypt agreeing to tear down the Aswan Dam, and to put its fate as a nation on the goodwill, political reliability, and growth of upriver neighbors with a long history of mutual suspicions and occasional wars, domestic instability, impoverishment, and humanitarian tragedies. This is not a vision that any leader of any nation is likely to embrace welcomingly. Nevertheless, by the latter part of the first decade of the 2000s, the political economic landscape began to tilt against Egypt. Sudan is planning to erect new dams on the Nile with Chinese assistance. Both Ethiopia and Sudan have begun leasing prospective farmland to grow crops for dry, hungry, rich foreign nations such as Saudi Arabia. Other basin states are launching unilateral projects. A proliferating number of small, earthen dams 10 feet high being built by local Ethiopian and Sudanese farmers on tributaries of the Nile are siphoning a growing volume of Nile water—totaling 3 to 4 percent of the flow at Aswan by the mid-1990s—before it reaches the river’s main stem. Ethiopia’s diplomatic leverage increased with the discovery of a previously unknown aquifer stocked by Blue Nile runoff that could be pumped for irrigation and the sense that it could outwait an increasingly desperate Egypt for better concessions on the Nile. Against this background Egypt, Ethiopia, and Sudan, with other Nile basin countries, launched a more vigorous new series of meetings to try to reach a comprehensive accord on joint basin investment and development. Throughout the world, nations sharing international waterways have been forming cooperative basin initiatives in response to water scarcity. The Nile Basin Initiative was less advanced than many, and faced challenges graver than most, but offered large potential rewards for all. For the first time, the Egyptians are showing a genuine, pragmatic willingness to seriously entertain, with international monitoring and financing, significant dam storage volumes in the low evaporation rate highlands of Ethiopia. Indeed, through reduced flood loss from dam control, basin experts calculate that Ethiopia will actually be able to provide all the irrigation water envisioned in its own master plan, create much additional hydroelectricity, and still release greater amounts of water downstream to Sudan and Egypt than it does presently. By recouping much of the amounts lost to evaporation in the equatorial Sudd swamps through completion of the long-sidetracked canal, a Nile Basin Agreement, if realized, could yield an extra 10 billion cubic meters or more from the river. Throughout the basin, irrigated food production and hydroelectric generation could expand enormously, the Nile ecosystem become better managed, and, possibly, a cooperative regional sense of shared difficulty rather than competitive enmity could gradually begin to take hold. All the world has a vested interest in helping Egypt and its neighbors muddle through, since any political upheaval in Egypt is likely to transmit instability throughout the water-starved, volatile Middle East and North Africa. Water had already helped spark an actual hot war in the smallest and driest of the ancient Fertile Crescent cradles of civilization, the Jordan River basin. In one of the world’s political hot spots, Israelis, Palestinians, Jordanians, and Syrians contest to control and divide the scarce resources of a region that long ago ran out of enough freshwater for everyone. By 2000, people living in the heart of the basin were withdrawing 3.2 billion cubic meters of water, well in excess of the 2.5 billion cubic meters that recharged each year by natural rainfall. The tiny Jordan River, only 4 percent the size of the Nile, is routinely reduced to a mere trickle south of the freshwater Sea of Galilee, failing to replenish the ever saltier and shrinking Dead Sea into which it empties. Much of the shortfall has been met by overpumping groundwater from the region’s main aquifer systems—three on Palestinian lands in the Israeli-occupied West Bank and one in coastal Israel. In all, the more than 12 million inhabitants of the Jordan basin have only one-third as much freshwater as needed for food self-sufficiency; regional stability, therefore, depends upon an uninterrupted flow of virtual water in the form of food imports. At the time of Israel’s creation in 1948, there was enough freshwater for all the Jordan basin’s peoples. Shortages started in the 1950s with the doubling of water consumption as Israel’s arid landscape was transformed into irrigated cropland by kibbutzim and individual farmers. To head off impending water conflicts, America’s Eisenhower administration in the early 1950s sent a special ambassador, Eric Johnston, to try to negotiate a Tennessee Valley Authority–type water-sharing accord that would improve economic, social, and environmental conditions for all basin residents. Remarkably, Johnston forged an agreement among all the representative water professionals. But political polarization, and rising Arab nationalism on the eve of the 1956 Suez Crisis, intervened to doom the landmark water accord when Arab ministers meeting in October 1955 rejected it. The fateful 1967 war started with Nasser’s expulsion in mid-May of the U.N.’s Suez Crisis era buffer force and Egypt’s ensuing reblockade of Israel’s only shipping route to the Red Sea and Indian Ocean. With united Arab military forces amassing on every Israeli frontier, and Arab popular opinion openly rejoicing at the prospect of Israel’s anticipated destruction, Israeli leaders launched a secret first strike on the morning of June 5. While ground forces burst through the Egyptian border into Gaza and Sinai en route to the Suez Canal, Israel’s entire small air force, leaving Israel undefended, deployed stealthily for the air bases housing the Arabs’ much larger force of Egyptian-led warplanes. Within hours, following furious bombing and antiaircraft fire, the core of the Arab air force lay smoldering in ruins without ever having gotten off the ground. Over the next few days of fighting, Jordanian troops were driven out of the entire West Bank and surrendered the Old City of Jerusalem. Syrian tanks were beaten back up the slopes of the sparsely populated Golan Heights, which they soon abandoned in flight for Damascus. The stunning results of the Six-Day War transformed the geopolitics of the Middle East. Israel’s territorial extent suddenly quadrupled. Of equal significance, but less public notice, the hydrological balance of power between Israel and her neighbors also shifted decisively. Before the war, Israel had controlled less than 10 percent of the Jordan watershed. After the war, it was the basin’s dominant water power. Coming under Israel’s total control were the West Bank’s underground aquifers, including the large, western aquifer that runs north-south along the foothills near the Green Line and flows west toward Israel and the Mediterranean Sea while recharging primarily on the occupied Palestinian territories. By the early 2000s, the West Bank aquifers were supplying one-third of Israel’s freshwater. Of even greater strategic importance, the Golan Heights, annexed in 1981, gave Israel geographic possession of a vital catchment for its renewable Sea of Galilee, the source of another third of Israel’s water. The Golan also gave greater security over more headwaters and sources of the Upper Jordan River, as well as frontage on the Yarmuk River that fed the Jordan south of Galilee, and was historically famous as the site of the 636 Muslim victory over the entrapped Byzantine army that opened the floodgates of the Levant and Egypt to Islam’s early military juggernaut. The conviction that Israel is stealing Arab water that must be recovered has become another of the inflammatory passions and potential hair triggers in the dangerous Arab-Israeli tensions. Israel exploited its sudden new water bounty to fuel a round of economic growth and modernization. In 1982 it integrated the West Bank’s water supplies into its National Water Carrier network. At the same time, it used water as a national political tool by doling it out in disproportionately small drops to West Bank Palestinians through severe restrictions on drilling new or deepening existing wells. In one of the world’s starkest Water Have–Have-Not divides, as a result, Palestinians typically had only one-quarter as much water as the Israeli settlers living alongside them. Irrigated Palestinian farmland on the West Bank shrank drastically—from one-quarter to one-twentieth of cropland—as a result. Palestinians were forced to bathe and wash less frequently than their settler neighbors, many of whom enjoyed lawns and swimming pools, while many Palestinians suffered the further burden of having to pay a stiff premium for tanker-transported water to meet their basic drinking, cooking, and hygiene needs; in the villages around Nablus, for instance, some families had to pay as much as 20 to 40 percent of their income for water. On the coast, Israeli dams on the Wadi Gaza diverted for Israeli farms the main recharging source of the shallow and badly overdrawn aquifer that was the sole natural supply of the Palestinian Gaza Strip. Depletion of the Gaza Aquifer grew so bad that that seawater and sewage easily infiltrated, leaving some 1.4 million Gaza Palestinians to drink contaminated water that was often literally sickening and an epidemic health hazard. Water famine and rage over “stolen” Arab water even exacerbated the 1987 intifada, which first erupted in Gaza before spreading across the West Bank. Given the severe water scarcity and stark inequity in available supply between Israel and its Jordan basin neighbors, water was one of the contentious core issues in the regional peace negotiations that ensued from the famous handshake between PLO leader Yasser Arafat—himself a civil engineer with a professional understanding of water issues—and Israeli prime minister Yitzhak Rabin in September 1993 on the lawn of the White House. Along with territorial borders, settlements, refugees’ right of return, and Jerusalem, water was one of the five central issues, and one of Israel’s top priorities, in the Israeli-Palestinian Oslo peace process. The September 1995 interim accord affirmed the unequal four to one sharing of the mountain aquifers. Israel formally recognized Palestinians’ right to West Bank groundwater, including a small increase to alleviate immediate scarcity and a promise to help Palestinians develop the eastern aquifer—which in fact, the Israelis had unsuccessfully sought to develop themselves for years. The goal of sharing West Bank groundwater on a more equitable basis, however, was put off to the final-status stage; it fell by the wayside when the peace process collapsed in 2000. The Palestinian-Israeli peace talks provided political cover for the 1994 treaty between Jordan and Israel. The treaty included an Israeli concession to supply an additional 50 million cubic meters of water per year to help meet water-famished Jordan’s minimum needs, as well as commitments to cooperate on joint water resource development and to confront the challenge of regional scarcity. The fact that water experts from both nations had been secretly meeting for years since the collapse of the 1950s Johnston Mission along the banks of the Jordan River at regular “Picnic Table Talks” to exchange information and sometimes coordinate water operations facilitated the swift achievement of the peace treaty. Helpful, too, was the pragmatic, unwritten understanding the two nations had forged in 1969–1970 whereby Israel agreed to desist from further destruction of Jordan’s vital national aqueduct in exchange for the kingdom’s curtailment of PLO raids on Israel across the Jordan River—an understanding that preceded Jordan’s bloody expulsion of PLO guerrillas in the battles of Black September 1970. In contrast, progress in negotiating the return of the Golan Heights with Syria, with whom no similar back-channel measure of trust and pragmatic understanding had been built, stumbled in 2000 in large part over Syria’s insistence on regaining access to the receded shoreline of Galilee, Israel’s main renewable reservoir and a vital linchpin of its national water security. A near water crisis flared soon afterward, in 2001–2002, when militant southern Lebanese Shiites allied with Syria took advantage of Israel’s 2000 unilateral withdrawal from most of south Lebanon after eighteen years of occupation to immediately launch a pipeline to divert a modest amount of water from the Wazzani Springs on the Golan border. The Wazzani fed the Hasbani River, which in turn provided one-quarter of the supply for the Jordan River. With five times more supply per person than Israel, water-sufficient Lebanon could have chosen to divert surplus water from another source, such as the Litani River, that flowed entirely within its borders and would have required shorter transport to the villages the water was allegedly intended to serve. With overtones of events leading to the Six-Day War, Israeli prime minister Ariel Sharon warned that Israel regarded the Wazzani diversion as a deliberate provocation that was a potential cause for war; a timely international diplomatic flurry at the highest government levels of the United States, the U.N., and the European Union in the fall of 2002 averted a violent blowup. Renewed back-channel talks between Syria and Israel, brokered by non-Arab Muslim Turkey, came very close to a breakthrough over the Golan and the Jordan waters, but did not have sufficient American support and was overtaken by new regional Israeli-Palestinian violence in Gaza in the winter of 2008–2009. Israel’s response to its water scarcity challenge was unique among countries in the region. It went beyond simply struggling to secure dominance over as much of the region’s natural surface and groundwater supply as possible. It also positively embraced policies that promoted more-productive use of existing supplies and the pioneering use of innovative water technologies. In response to the drought-induced water crisis of 1986, for instance, Israel cut agricultural water consumption by nearly one-third within six years by sharply trimming water subsidies to more fully reflect the total cost of sustainable provision and delivery; subsequent cuts moved Israel closer toward its ultimate national goal of reducing irrigation consumption by 60 percent. Under the stress of a 2008 water emergency, most Israeli farmers agreed in principle to pay full market price to the state water company. Israel redirected its agricultural water savings toward higher economic return uses in industry and high-tech sectors, vital urban water systems, and low-water-intensive, high-value crops. Typical of advanced economies, agriculture’s share of Israel’s overall economic output was only about 2 percent, even though it consumed three-fifths of the nation’s water. The more efficient use of existing water enabled Israel to earn the revenue needed to import food and other virtual water goods it could not itself sustainably produce. Israel’s economic restructuring represented a paragon alternative development path for Egypt and other water-famished nations of the Middle East. Israeli farming’s global reputation for efficiency was also burnished by its leadership in using many advanced water technologies. Notable among these was the growing trend toward treating, recycling and then reusing wastewater, for farming and purposes where lower water quality sufficed. Three-quarters of treated sewage from Tel Aviv and other cities, for instance, was pumped to farms in the Negev and other areas to grow crops in the early 2000s. Much of the recycled wastewater was used in high efficiency, drip irrigation systems pioneered by Israeli engineers in the 1960s. Drip irrigation delivered water directly to the plant roots through underground, perforated tubes; modern techniques combined computer monitoring of soil conditions to deliver precisely calculated amounts for optimum crop growing. Through drip techniques, crop yields per unit of water input often doubled and tripled. Only about half the water in traditional flood irrigation, by contrast, ever reaches the plant roots, while much is wasted to evaporation as well. Two-thirds of Israel’s agriculture employed such microirrigation methods by the early 2000s; Israeli experts helped transplant the same techniques to neighboring Jordan, which applied it on over half its own farmland. Through the combination of drip irrigation and recycling treated wastewater, Israeli farmers quintupled their water productivity in the thirty years leading up to 2000. Water efficiency is a necessary, but not a sufficient, response for water-famished regions like the Middle East. New water supplies are also needed. To supplement its water supply, Israel was increasingly turning to state-of-the-art, large-scale desalinization of seawater. Although long employed in some extremely water-scarce, coastal regions where there was no alternative, desalinization had been prohibitively expensive since it required vast amounts of energy to evaporate water or, using more modern, reverse-osmosis techniques, to filter out the salt through a very fine membrane under high pressure. Until recent advances, desal water often cost a hundred times more than natural water supplies. From the 1990s, desal costs at reverse-osmosis plants began to fall sharply—by as much as two-thirds. By the turn of the twenty-first century, water scarcity and falling desal costs induced Israel to launch five large, state-of-the art desalinization plants along its southern Mediterranean coast north of Gaza. The first, at Ashqelon, opened in 2005. It delivers high-quality freshwater at under two times the cost of water pumped up from the Sea of Galilee to Tel Aviv. A drought emergency in 2008 spurred a further commitment to desal—by 2020 Israel expects to produce 750 million cubic meters of desalinated water each year, or more than the amount drawn from West Bank aquifers. Whether economical or not when measured in purely conventional market terms, desalinized water contains a potentially priceless political dividend if it delivers water security and one of the keys to peace with the Palestinians. To further bolster its long-term security, Israel also began tapping a new, very expensive, but important strategic water source by buying a small amount from the Middle East’s rising water superpower, Turkey. In the early twenty-first century, non-Arab, Muslim Turkey looms as an increasingly pivotal regional power not only because it is the frontline between the West and the Islamic world, controls maritime access between the Mediterranean and Black Sea, and is a formidable military power, but also because of its growing leverage as the Middle East’s water-wealthiest nation. Turkey’s many mountain rivers provide its population with at least 10 times the per capita supply of Israel and triple that of Syria. Of particular strategic significance, its snowcapped, mostly Kurdish-inhabited, southeastern highlands, control the headwaters of both the mighty twin rivers of ancient Mesopotamia, and with it the freshwater lifelines of thirsty modern Syria and Iraq. Some 98 percent of Euphrates water originates in Turkey, before passing through Syria and on to Iraq and the Persian Gulf. Nearly half of Tigris water also comes from Turkey, with most of the rest originating in tributaries from rugged, remote regions of Iran. For nearly all of history the prime beneficiary of the twin rivers’ waters had been the dry-land, downstream region corresponding to modern Iraq, whose fertile swath of soils it brought to life with agricultural abundance. Yet 80 percent of Iraq’s waters originate outside the country’s boundaries. When Syria acquired the wherewithal to build giant, multipurpose dams and divert a large share of its water in the 1970s, some of the traditional advantage conferred by upstream position migrated northward along the Euphrates. A decade later, the balance of power shifted even more decisively upriver to Turkey when it similarly began to master its abundant natural water resources. The linchpin of Turkey’s ambitious water development program is the Southeast Anatolia Development Project, or GAP, a multidecade plan for 22 dams, 19 hydropower projects, and multiple irrigation schemes. The GAP is intended to transform the poor, politically restless region of 6 million people, more than double national irrigated cropland and electricity output, and turn Turkey from a food importer into a food exporter. Its centerpiece is the monumental rock-and-earth Ataturk Dam—Turkey’s Aswan—which was completed in 1990. By itself, the Ataturk reservoir can hold five times the annual flow of the entire Euphrates. “The twenty-first century will belong to Turkey,” proclaimed Turkish leader Turgut Ozal from the ramparts of the 600-foot-high, mile-wide dam at its opening festivities. The prospect of restored Ottoman glory—and Turkish hegemony over the region’s water—however, was as alarming to Turkey’s downstream Arab neighbors as it was thrilling to the Turkmen. When completed, the GAP is expected to cut Syria’s share of the Euphrates’ water by as much as 40 percent and degrade its water quality, and leave only 10 percent of its historic flow for parched Iraq. Furthermore, the uncoordinated Euphrates dam and irrigation projects of Turkey, Syria, and Iraq, when aggregated, will consume half again as much water as exists in the entire river—a physically impossible scenario in which upstream Turkey would be the ultimate arbiter of who got how much and when. In the early, euphoric anticipation of its water windfall, Turkish leaders in 1987 had grandly offered to sell some of its water surplus and deliver it through two 1,000-mile-long Peace Pipelines throughout the Middle East. One pipeline was envisioned to carry water south through Syria and the Jordan Valley—with a spur reaching Israel and Palestine—and on to the holy cities of Medina and Mecca in Saudi Arabia; the second was foreseen to run eastward through Iraq and Kuwait to the Persian Gulf. The price of freshwater transported through these immense pipelines was forecast at only one-third that of desalinized water. Turkey’s vision was that its waters would be the tonic of regional cooperation and peace—with Turkey’s hand on the strategic and diplomatic control valves. The Peace Pipelines never got off the engineering drawing boards, however. They were done in by the dry realities of Middle Eastern water politics. Syria and Iraq reacted with bellicose protests when Turkey, in a thinly disguised flexing of its water power, began filling the Ataturk Dam for three weeks in January 1990 and the Euphrates slowed to a trickle. To show its displeasure, militarily inferior Syria broke a 1987 unofficial agreement and began providing greater clandestine support throughout most of the 1990s to the Kurdish separatist rebels of southeastern Turkey, including their most wanted terrorist leader, Abdullah Ocalan. Iraqi dictator Saddam Hussein, meanwhile, moved diplomatically closer to Syria and saber rattled about bombing the Ataturk Dam. Cutting off Euphrates water was evaluated by U.N. members as a countermeasure to try to force Saddam to withdraw his invading Iraqi troops in the run-up to the first Gulf War. Although the plan was not adopted, water became part of the Gulf War battlefield: Iraq’s water supply and sanitation infrastructure was intentionally targeted and destroyed, while Iraq itself razed much of Kuwait’s desalinization plant as it retreated. The modern use of water as a tool of diplomacy and warfare on the twin rivers is as familiar as it had been in ancient Mesopotamia. In the mid-1970s, Iraq and Syria had amassed troops on each other’s border and narrowly averted war over Syria’s constriction of the Euphrates’ water as it filled the reservoirs of one of its giant dams—which Saddam also threatened to bomb—while Syria more than once intentionally slowed the flow during the critical sowing season to show its displeasure with Iraqi criticism of its policies. From 1985 to 2000, with special vigor following the Shiite rising against his regime after the first Gulf War, Saddam launched a targeted assault on the fertile, fish-rich marshland ecosystem along the twin rivers’ lower reaches north of Basra in historic Sumeria in the vicinity of the putative Garden of Eden that was home to a quarter-million, mostly Shiite, Marsh Arabs. Through massive drainage diversions—complemented by intentional pesticide contamination and high-voltage electrical shocks to the water to kill surviving fish life—the great marshlands shrank to one-tenth of its historical size. Its population fell in close proportion. Reflooding after Saddam’s final fall in the second Gulf War was able to restore only 40 percent of the marshes. The dispute over the waters of the twin rivers flared again in mid-1992 when Turkey’s prime minister, Süleyman Demirel, a hydrological engineer, stridently rejected Syrian and Iraqi objections to Turkey’s irrigation and hydroelectric projects with an implicit threat of withholding water as retaliation: “We do not say we share their oil resources. They cannot say they share our water resources. This is a matter of sovereignty. We have the right to do anything we like.” Throughout the early 1990s, reduced Euphrates flow idled seven of 10 turbines at Syria’s giant Tabqa Dam, contributing to Syria’s electricity energy crisis. By 1998, troop exercises were being carried out on both sides of the border. War was averted by third party diplomacy and Syria’s expulsion from Damascus of Kurdish radical leader Ocalan. Although some diplomatic progress over water sharing was made in the early 2000s, Turkey pointedly remained one of the three nations in the world—along with China and upstream Nile riparian nation, Burundi—to vote against the 1997 U.N. Watercourses Convention declaring that international waterways should be shared reasonably and equitably, and not cause unnecessary harm to neighbors. With population growing rapidly in all three Euphrates basin countries; soil salinization, pollution, and food shortages worsening in Iraq and Syria; and greater claims being made on the twin rivers than it had total water, the day of reckoning in the Mesopotamian cradle of civilization and location of history’s first recorded water war is drawing uncomfortably closer. The degree of Turkey’s willingness to open the Euphrates’s spigot at the Syrian border is also a significant lever in determining Syria’s willingness to compromise on Golan water in its peace negotiations with Israel. Water trade strengthens Turkey and Israel’s own military and diplomatic cooperation in an Arab-dominated region, and makes Muslim Turkey a credible intermediary in the conflict between Israel and its Arab neighbors—a role it has been assuming with increasing visibility. Yet Turkey’s exercise of water diplomacy risks elevating the domestic leverage—and potential countervailing international support—of its own independent homeland-seeking Kurds, since the Turkish part of Kurdistan is where the Tigris and the Euphrates originates. The Kurds’ brethen in neighboring northern Iraq on the Tigris are already using their control of Iraq’s largest hydroelectric dam to press their demand for more territory and autonomy in the post-Saddam Iraq as American troops begin to pull out. From a still-larger perspective, Turkey’s water supply represents a strategic resource that might, in time, offset some of the economic and political supremacy that oil delivers to the water indigent and ever more overpopulated Arab world. While the risk of water war in this thirstiest and most politically combustible of regions is high, it is by no means inevitable. The existential threat posed by water scarcity is so palpable that it generates opposing cooperative instincts for mutual survival as well. At the worst moments of the second Palestinian intifada, while Israel’s hegemony over West Bank water was being vehemently decried by angry stone throwers, Palestinian and Israeli officials continued to meet quietly and agreed not to damage each other’s waterworks. As a religion of the desert, Islam accords water a special esteem that also favors cooperation. All inhabitants in the starkly arid land share an intuitive appreciation of the Turkish proverb: “When one man drinks while another can only watch, doomsday follows.” In what might be considered a corollary of the mutually assured destruction doctrine that helped avert direct military conflict in the postwar nuclear age, it is possible that with rare statesmanship and sufficient desperation, a Middle Eastern water famine might lead inexorably not to devastating warfare but to a cooperative model of water détente that helps forge regional peace. It would be ironic, but not impossible, if salvation from the worsening regional water crisis came about through a resurrection of the faded dream of a marriage between state-of-the-art Israeli agricultural know-how and Arab oil investment. Meanwhile yet another water shock with the potential to unsettle regional and international balances of power lurks in the torrid, sandy expanse of the Saudi Arabian desert. Geology played a cruel trick on the Saudi kingdom: While blessing it with the world’s largest oil reserves, its natural endowment of freshwater is among the planet’s most meager. Therefore, its future depends much on how effectively it converts its short-term abundance of oil into a sufficient, sustainable, long-term supply of freshwater. The Saudi landscape holds neither lakes nor rivers. For centuries, almost all its water came from underground—a shallow aquifer that was easily tapped by wells or at oases that recharged with rainfall and was able to support only a modest population at subsistence level. But much farther beneath the surface, about one-quarter of a mile deep, lay other, sizable, nonrenewable fossil aquifers—one-sixth as large America’s Midwest Ogallala—containing pristine water from up to 30,000 years ago that had trickled down over bygone ages when the surface climate was wetter. The oil boom and drilling technology of the 1970s made Arabia’s fossil aquifers largely accessible for the first time. Instead of using its new treasure of ancient water prudently, Saudi monarchs went on a water binge as profligate as the industrial West’s burning through its oil. They mined it from deep beneath the ground as fast as they could. A spare, arid culture became awash with decorative fountains, modern plumbing, and lush golf courses overnight. Fearing retaliatory Western grain export restrictions in response to their OPEC cartel’s 1973 oil embargo, Saudi monarchs sought to achieve food independence by subsidizing the saturation of the desert with free groundwater until it bloomed with grain. In one of economic history’s most extravagantly subsidized and hopelessly uneconomic enterprises, the Saudis not only attained self-sufficiency in desert wheat, but from the mid-1980s became one of the world’s leading grain exporters. The production costs, however, were staggering—five times greater than the selling price of grain on international markets. An even more punishing cost was the rapid depletion of the nonrenewable, precious aquifers themselves. Surveys in the 1980s estimated that Saudi Arabia had 400 million acre-feet of groundwater reserves–about thirty years’ annual flow of the Colorado River. But by pumping out nearly the equivalent of one Colorado River per year—eight times greater than the volume of renewable water recharge—the Saudis had exhausted about 60 percent of the accessible aquifers by 2005. The pace of depletion was slowed, but not arrested, from the 1990s by the chopping of subsidies that slashed wheat production by 70 percent from the peak in 1992. Another means of converting Saudi oil into water is to desalinate water from the peninsula’s surrounding seas. Yet even with virtually costless oil energy to power desalinization plants on its eastern coast, Saudi production of renewable, desalinized water has been able to substitute for only a fraction of the natural fossil water used by its 25 million people. Early in the twenty-first century, fossil water is still providing half the domestic water for Saudi cities and over 70 percent of the huge volumes consumed by agriculture. Belatedly, the Saudi monarchy formed a Ministry of Water and began to preach water efficiency. To symbolize its national goal of reducing domestic consumption by half, the de facto ruler, Crown Prince Abdullah, in 2004 replaced the palace’s extravagant 10-quart toilets with six-quart models. But it was too little, too late. The reforms lacked strong price incentives or commanding enforcement. Saudi farmers went on planting water thirsty alfalfa, which consumes four times as much water as wheat, as feed for the cattle that satiated the nation’s new appetite for dairy products. In the cities, little water is being recycled. Two-thirds of all dwellings are unconnected to sewage treatment plants so that raw sewage pollution is seeping into shallow groundwater, compounding the nation’s scarcity crisis. In effect, Saudi Arabia is squandering its one-time opportunity to use its nature-endowed fossil reservoir to restructure its water use and management patterns. Instead, like so many other water impoverished countries, its fate depends much upon the deliverance from an as yet unforeseeable breakthrough in desalinization or another momentous water technology. By as soon as 2025, the Arabian aquifers may be scraping bottom. In the short run, Saudi Arabia can mitigate the dire impacts by continuing to desalinate with profits from its natural supply of oil for its most indispensable uses and to spend its petrodollar surpluses on importing virtual water as food. Indeed, it was already using some of its oil wealth to buy or lease farmland in nearby Sunni Islamic nations like Sudan and Pakistan, as well as in multireligious Ethiopia just across the Red Sea, in a bid to secure a reliable, future foreign source of food. But reliance on imported food, especially from unstable states dependant on water from their own overstaxed river basins, is a highly uncertain proposition, and slowly consumes the Kingdom’s treasury during what looks likely to be the beginning of the end of the golden age of oil. Eventually, its oil reserves will sputter out, too—then modern Saudis may painfully experience the knowledge of their desert forbearers that water, not oil, is man’s one truly indispensable resource. Two stark, alternative futures were playing out on the arid Arabian Peninsula’s eastern and western flanks, where the oil had already given out. On the Persian Gulf to the east, Abu Dhabi had astutely invested its oil surpluses to build a low-water-intensive, international services entrepôt of banking and shipping closely integrated into, but reliant upon, the global economy that provided the food it could not grow itself. To the southwest, on the Red Sea, was highland Yemen, one of the world’s most dangerous failing states, where plunging water tables were sparking rural violence, mass migration to overcrowded cities, radical Islamic fundamentalism, and international terrorism. The desert Muslim leader who has been most audacious at turning oil into water is Libya’s Muammar el-Qaddafi. Qaddafi bet a large proportion of his country’s petrodollar wealth, and his government’s own ruling legitimacy, on mankind’s grandest underground water transfer scheme—the Great Manmade River. The project mines ancient fossil water from the huge aquifers lying beneath the remote southern Sahara desert, at a depth of an inverted Empire State Building, and delivers it through a 2,000-mile network of subway-sized tunnels buried six feet under the scorching, shifting sands to the Mediterranean coast, where 85 percent of Libya’s 6 million people live. Waterless Libya first discovered that below its empty desert forty days’ camel trek from the coast lay soft, water-bearing rock structures containing 50 billion acre-feet of water—the largest known fossil water deposit on Earth—when oil-seeking Western drillers began intensive explorations in the mid-twentieth century. Much of the water in the Nubian Sandstone Aquifer originated as rain 25,000 to 75,000 years ago; more filled during a second rainy period, about 4,500 to 10,000 years ago before the Sahara transformed from a wildlife-rich savanna of roaming herds pursued by tribes of hunter-gatherers into today’s desert. Enthralled by his vision of a bounteous Libya, Colonel Qaddafi launched his subterranean Manmade River with support from Occidental Petroleum magnate Armand Hammer soon after he seized power in 1969. Despite adversarial political relations with the West over Libya’s involvement with state-sponsored terrorism, other American companies, such as Halliburton subsidiary Brown & Root, helped Qaddafi’s “new Nile” deliver its first water to the coast in 1991. Yet the immensity, complexity, and expense of Libya’s heroic water transfer project have raised doubts whether it can ever be completed or deliver its intended salvation for Libya. In 1999 pipeline blowouts began to occur, shooting geysers of water 100 feet into the air; repairs were hampered by the difficulty of moving heavy machinery across the desert terrain. Even if fully realized, the Manmade River will likely deliver only enough water—less than the Jordan River system—to meet less than half of the food needs of Libya’s small but rapidly growing population. But even that amount has been enough to whet the envious thirst and warnings against Libyan overpumping from Egypt, Chad, and Sudan, under whose territory part of the Nubian Sandstone Aquifer also lies—and exacerbate worries in Egypt that the falling aquifer table might cause intolerable seepage loss of Nile basin groundwater. Like camels smelling water in the desert, Libya’s neighbors are homing in on ways to wrest a share of the Sahara’s buried water treasure for themselves.